2019-02-15 08:53:11 GMT <alfresco-discord> <Hiten> I am trying to use system user but getting the below error Caused by: org.alfresco.service.cmr.workflow.WorkflowException: 01150035 runas user 'system' does not exist. 2019-02-15 09:23:07 GMT <alfresco-discord> <new-user> Is this site down https://artifacts.alfresco.com ? 2019-02-15 09:23:23 GMT <AFaust> Alfresco is currently experiencing some issues with some of the web sites. 2019-02-15 10:04:14 GMT <AFaust> @Hiten: I would personally use the "end" event on the "startTask" itself to attach a listener and store the tenant-specific System / admin user name in a process variable for later resolution via an expression. 2019-02-15 10:26:57 GMT <alfresco-discord> <Thijs> using docker volumes, or host mounts? 2019-02-15 11:15:55 GMT <fwu2018> afaust, did you find anything about aos? 2019-02-15 11:18:25 GMT <fwu2018> what this property is and where is defined? 2019-02-15 11:18:47 GMT <fwu2018> may be this that makes Alfresco tell Word to open in read only mode? 2019-02-15 11:20:57 GMT <fwu2018> outside Alfresco the first thing Word does is to make a lock on the file. Something that it doest do when the file is open inside Alfresco. 2019-02-15 11:27:52 GMT <AFaust> Though I don't know how much of that may match up with your specific issue. 2019-02-15 11:29:54 GMT <AFaust> In the network trace I can see that the Mac Word client is using a completely different pattern of requests to Alfresco (different SharePoint protocol version/logic? ), and in one of the responses sent by Alfresco that relates to URL mappings, the answer is slightly different to the response of a similar operation called by a Windows Word client. 2019-02-15 11:34:07 GMT <AFaust> Yeah, but the port does not actually make a semantic difference. 2019-02-15 11:34:33 GMT <AFaust> Right - and it can be omitted, but it is perfectly legal to include it. 2019-02-15 11:36:42 GMT <AFaust> Well - for my customer, it used to work before (up until a few weeks ago), but does not anymore after an Office update. So I assume all the previously important configuration was already done, and for some reason the update only changed the interaction model. 2019-02-15 11:37:25 GMT <AFaust> There are other quite noticable differences in the HTTP operations being triggered by Mac Word vs. Windows Word, but those do not directly relate to a response that includes the word "failure"
2019-02-15 11:38:30 GMT <fwu2018> afaust, can you tell me if on the first call after clicking the edit button you get the same property value? 2019-02-15 11:45:34 GMT <fwu2018> but I dont have a way to compare. that is why Im asking your working example. If you have also this property to false, then it isnt the real problem I have. 2019-02-15 11:50:13 GMT <AFaust> Oh... I am / my customer is way beyond that. 2019-02-15 11:51:30 GMT <AFaust> Of course if you open a document from AOS WebDAV you don't actually know in advance if you have permission to edit it, and as such can expect it to show up as read-only if you don't actually have the permissions. 2019-02-15 11:51:50 GMT <AFaust> I had assumed you had already checked the permissions and made sure in your example / issue that they are not standing in your way. 2019-02-15 12:00:02 GMT <fwu2018> so why I get "onlineEditing": false for that node? that is my question, but maybe is not related with webdav. 2019-02-15 12:03:59 GMT <fwu2018> so my idea is that alfresco thinks the node should be editable online and is saying to Word to open it in read-only. 2019-02-15 12:04:13 GMT <fwu2018> but where i set online editing for the node/site? 2019-02-15 12:04:49 GMT <AFaust> Well, when you open an Office document via AOS WebDAV, that essentially ends up behaving like online editing. 2019-02-15 12:07:48 GMT <fwu2018> why the metadata returned by the doc2lib has an onlineediting property? 2019-02-15 12:14:56 GMT <AFaust> That property means "has the module org.alfresco.module.vti been installed"
2019-02-15 12:15:52 GMT <fwu2018> I also believe I dont need any info about vit on my config, right? 2019-02-15 12:16:27 GMT <fwu2018> is this sufficient? 2019-02-15 12:17:35 GMT <AFaust> That is what I have done in my case and found that one response contained a list of "failedUrls"
2019-02-15 12:17:49 GMT <AFaust> So of course the client then did not proceed to do anything more with the document. 2019-02-15 12:21:45 GMT <fwu2018> but do you think this may be the reason to get a read-only document? 2019-02-15 13:38:28 GMT <alfresco-discord> <kgastaldo> Hi All - www.alfresco.com, issues.alfresco.com, and docs.alfresco.com are all down. We're working to resolve! 2019-02-15 13:43:03 GMT <fwu2018> afaust, it is working! 2019-02-15 13:58:27 GMT <fwu2018> afaust, do you know if it is possible to avoid the login box that is shown everytime the word oppens? 2019-02-15 14:23:24 GMT <alfresco-discord> <kgastaldo> Of course. Latest update: IT are actively working with Rackspace to resolve the outage. Investigations are centered on a possible DDOS attack with no ETA for resolution at this time. 2019-02-15 14:29:01 GMT <AFaust> What the heck? 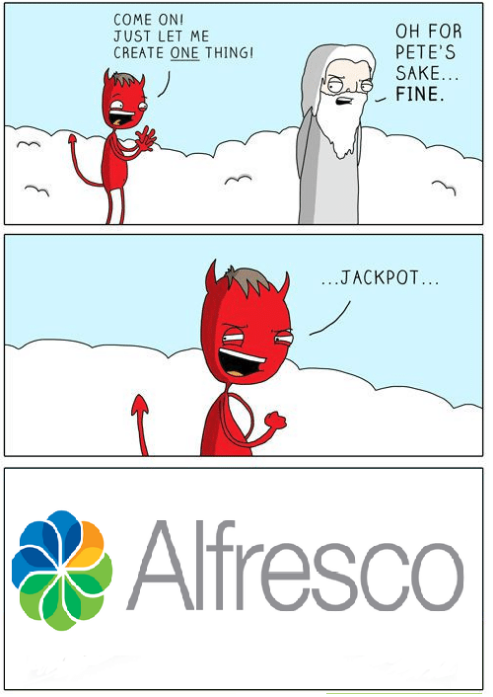 There is an /r/alfresco ? Is there anybody on there that "we" actually know? 2019-02-15 14:33:51 GMT <AFaust> So far, in all instances where I had to setup ACA for a customer to demo (the lack of features), I never had to deal with CORS at all. 2019-02-15 14:41:42 GMT <AFaust> Alexander Seitz: I know that the filter stuff is what Eugenio documented in his superficial blog post, but I seriously wonder if this is even at all necessary in any reasonable setup. 2019-02-15 14:42:45 GMT <AFaust> ... mostly because I never did any of that and never ran into any issues. To me, most of the CORS-related stuff has always appeared to be a "solution so devs don't have to think too hard"
2019-02-15 14:57:19 GMT <fwu2018> so, how can I replace that rewrite without broking edit online? 2019-02-15 14:58:26 GMT <alfresco-discord> <Alexander Seitz> how's your infrastructure? where is the adf app hosted? 2019-02-15 15:34:11 GMT <AFaust> Any URL /alfresco/xyz should already be properly mapped and forwarded to Tomcat by having the proxy in place. 2019-02-15 15:34:49 GMT <AFaust> So my question really is: Is your Tomcat configured correctly, i.e. do you have those web.xml config in place that Eugenio documented in his blog post? 2019-02-15 15:35:36 GMT <AFaust> Did you include the public address / location of your ADF app in the pattern for allowed origins? 2019-02-15 16:14:55 GMT <alfresco-discord> <kgastaldo> Another update: Still investigating issue but possible fix on alfresco.com within the next hour. 2019-02-15 19:25:29 GMT <alfresco-discord> <kgastaldo> Looks like everything is back up and running! Sorry for the inconvenience today.